Life on a narrowboat can be as peaceful as it is idyllic BUT you need to understand the pros, cons, highs, lows, and day to day logistics in living on England's inland waterways. Let me help you find out all you need to know before you commit to what could be a very expensive mistake. I love writing my weekly newsletters. In addition to providing information to help aspiring boat owners realise their dream of owning a floating home, the newsletters are my personal diary. I know that reading what I have written in years to come will bring the memories flooding back. I love writing them but they take up most of my free time. On a Sunday when I press the button to send them on their virtual way some time before midday and 1pm, often after a 6am start, I breathe a sigh of relief and look forward to doing very little for the rest of the day. As I was finishing off last week’s newsletter I was constantly glancing up from my laptop screen to see the spring sun glittering on the water outside. I couldn’t wait to take our folding camp chairs on to the grassy peninsula next to the boat and spend an hour or two soaking up the sun as I read my Kindle. Unfortunately, as is often the case with English weather, things didn’t quite work out as I hoped. For a start, I had forgotten that our summer camp chairs are still in storage. Our storage unit is only three miles from where we moor but neither of us could be bothered with the hassle of fetching them. We decided to sit on the roof instead. I climbed on to the roof first with my Kindle and a mug of coffee. Sally followed a few minutes later still wet from the shower, looking forward to drying out in the sun. The view from the roof was glorious. There was a hint of green on the island’s weeping willows, a trio of ducks squabbled in the reeds next to the boat and the sun bounced off the small waves on the choppy water. Unfortunately the water was choppy because of the wind whipping across the marina, a wind which was much more pronounced on top of the boat. We did the typically English thing of wrapping ourselves up in coats pretending we weren’t cold but we weren’t fooling anyone, especially ourselves. We lasted about five minutes before we thankfully came to our senses and hurried in to the boat and the warmth of the fire. I’m glad we enjoyed our five minutes on the roof because Sally has gone now. Not for good. At least, I hope it’s not for good. She didn’t mention anything about not returning when she left. She has a problem to sort out. She doesn’t really want me to talk about it on the site but she’s happy for me just to say that it’s to do with the abuse of long term trust with her property and possessions in the Philippines. It’s important enough to tell her employer that she has to leave them for three weeks just four weeks after returning to work after a month away. It’s important enough for her to spend thousands of pounds of our hard earned savings to sort it out and it’s important enough for her to catch a flight back to the island within twenty four hours of discovering the problem. The trip won’t be pleasant. I took her to Heathrow on Wednesday afternoon. After an hour and a half in the car going to the airport, she had a three hour wait for the plane to Manila, a grueling fourteen and a half hour non stop flight, an exhausting ten hour wait for her one and a half hour connecting flight to Negros and then a final and quite worrying ninety minute ride on the back of a motorbike holding onto the rider with one hand and her suitcase with the other travelling on roads studded with potholes deep enough to swim in. Once she gets there she has to have her wits about her to resolve an extremely difficult and potentially volatile situation, a situation which has been caused by someone she has bent over backwards to help in any way she can over the last two decades. Both Sally and I agreed that there was no advantage in me going with her. The nature of the deceit fills me with rage so diplomacy wouldn’t be uppermost in my mind if I were to meet the offending party. We agreed that I would stay on the boat so at least one of us is still earning a crust. It’s interesting how my feelings about the space I have on the boat has changed over the last four years. I moved on to the boat after leaving the fairly large four bed detached house I shared with my ex wife for ten years. The boat felt tiny and quite claustrophobic. Over the next two years I became more and more comfortable with the much smaller living space, and then I met Sally. Sally’s regular visits became more and more frequent until, a year after we first me, she moved out of her house and on to the boat with her two spaniels. The boat felt quite small and claustrophobic again. As I got used to sharing the space with Sally, and used to having two dogs underfoot all of the time, I felt comfortable again. Now that Sally’s been away for a few days and I have the whole boat to myself, I feel as though I’m rattling around in too much space. I am sure now that if I was on my own I could quite comfortably live on a much smaller boat. I hope I never have the chance to put my theory to the test. Sally’s absence has given me more time to work on the site, or it would have done if I hadn’t agreed to work an extra day a week at the marina. Sundays are normally quite busy days on our wharf. We look after four four 60′ narrowboats for the Royal Navy; Trafalgar, Emma, Lafter and The Andrew. They are offered to RN staff at subsidised rates. When I first started working here I was a little nervous about doing instructions for the often all male crews. The hirers, often eight to a boat, would spend two or three minutes loading a minimum amount of luggage and then half an hour filling the boat with cases of beer. I had no need to worry though. The navy personnel are unfailingly polite and attentive during instructions and always in a good mood. One of our Sunday instructors is out on an extended cruise at the moment and another is about to leave for a five year contract in China where he will earn an obscene amount of money and then retire to a life of leisure on the waterways when he returns. I’m helping out until the cruising instructor returns which means that I’ve had to try and shoehorn my newsletter writing into evenings when I finish work and early mornings before I begin again. Before I forget, let me tell you about our latest resident, or maybe residents. We have at least one otter here at the marina. Last week for a couple of days we had three guys cruising around the marina in a strange looking craft. They were electro-fishing. Electro-fishing involves passing an electrical current through the water powerful enough to stun but not kill fish. The three man crew’s mission was twofold. They were working on behalf of CRT to remove zander and to check for otter damage on the fish they caught. Zander are a non native invasive and destructive fish which looks like a cross between a pike and a perch. Any zander caught are removed from the water and often sold to restaurants. The largest removed from our marinas last week weighed a very respectable 9lb. If otters are in an area, the first fish species to disappear are carp. We have (had) some monsters. Up until a couple of years ago I regularly saw fish weighing upwards of 20lb cruising in the shallows during the summer months. I didn’t see any at all last year. One of the electro fishers said that they stunned a carp with bite scars on its tail which is a very strong indication that otters are here. I know we also have mink here so I asked what impact they have on fish stocks. I was surprised to hear that their impact is marginal. They are more of a danger to water birds than they are to fish. So, if you pay a visit to one of our marinas at dusk and you think you see a dog swimming across the water, you’ve just seen a not so elusive otter. I can’t make up my mind whether I’m pleased that we have otters or sad that we have probably lost our larger fish because of them. There’s a huge amount of information on the site now. Much of it has been added by me over countless late nights and early mornings but much more has been contributed by a wide variety of experienced boaters. There are now four hundred and eighty pages of information on the main part of the site and a further four thousand nine hundred posts on the forum. Because there’s so much information, finding exactly what you want can sometimes take a while. Your only option until now has been the Google custom search facility which added a few months ago to the top of the right hand column on any of the pages on the main part of the site. It’s really good at finding the information you’re looking for. The problem is, you need to know what you’re looking for before you can search for it. There’s now another way to find what you want. I’m in the process of compiling a comprehensive index of all of the information on the site. It’s going to take me a few weeks to complete but here’s the index so far. It’s an alphabetical list of the most popular posts from the forum. I’ve yet to add the articles from the site and all of the content from the newsletter archive. I’ll also include everything from the narrowboat terminology newsletter and links to useful resources on other boating sites. Aerials – Television Aerials – If you can’t live without your Corrie, you’ll need a decent aerial for your boat. Aluminium narrowboats – They don’t rust so why don’t you see more of them on the inland waterways? Anchors – What’s the best size and weight anchor for narrowboats on tidal riverscolumn to both the left and the right of the content you are reading, you are on the main part of the site. Battery monitors – Gimmick or essential boating equipment? Beds – The pros and cons of fixed doubles and cross beds. You need to read this if you are taller or slightly wider than average. Bikes on board – Many boat owners do not have cars so they rely on bikes to get them to the shops (or the pub). Some use bikes to collect their cars after a day’s cruising. There’s a huge selection of bikes to choose from. Which are the best for your boat? Buying A Boat – The logistics A fascinating account from a potential narrowboat owner as he tried to get a boat out of the water so that it can be surveyed. Buying a boat – The best time of the year to buy a boat – Is there a deal to be done by buying a boat in the winter? Car insurance for boat owners – A boat owner had his car insurance cancelled when he told them he lives on a narrowboat. How does he approach other insurance companies? “Chiggers” – It’s a mite you can pick up from the ever growing population of Canada Geese. Beware! Condensation – Do all narrowboats suffer from damp? What can you do about it? Condensation – Windows – Why do narrowboat owners tolerate condensation? Why don’t they have modern uPVC windows fitted? Continuous Cruising – The Cost Of Continuous Cruising – How much does the nomadic lifestyle really cost? Cruising – Pre Cruise Checklist – What checks do you need to carry out before you set out on a cruise? Damp: Dealing with condensation – Do all narrowboats suffer from damp? What can you do about it? Depreciation – How much does a new narrowboat lose in value as the years go by? Digital maps – GPS Devices and Canal Mapping – Are there any decent ones available for your narrowboat and do you need them anyway? Digital music – Getting Rid Of Space Wasting CD’s & DVD’s – The solution is to digitise your collection. Here’s how to do it. Diesel Costs – You need it to run your boat and maybe your heating system. How much can you expect to pay for it? Diseases- “Chiggers” – It’s a mite you can pick up from the ever growing population of Canada Geese. Beware! Electric Boats – What do they cost to run? Why would you want one? There’s a huge amount of information for you here if you’ve ever considered an alternative to a diesel narrowboat engine. Engine size and performance – Most engines are suitable for pottering about on the canal but what size engine do you need if you plan to cruise on rivers? Finance – Narrowboat Finance – A Canadian hoping to move to the UK, buy a boat and cruise the network. Flooring – The best flooring for a narrowboat pets – What’s the best way to protect your floor from a dirty doggy? Fuel Contamination – How do you know if you’ve water in your diesel… and what do you do about it when you have? Furniture – Narrowboat Furniture – Not everyone wants fitted furniture on their boat. Here are a few ideas if you want to add your own. Generators – A Big Inverter Or A Suitcase Generator – What are the pros and cons of either option? Height – Is a narrowboat suitable for you if you are above average height? Hire boats – Best Ex Hire Boats – Are you considering buying an ex hire boat to live on? Should you? Here’s some important information for you. Internet access – How do you connect to the internet when you live on a boat? Internet Data Theft – Did you know that you can have your boat’s broadband allowance stolen? Here’s what you can do to prevent the theft. Inverters – Problems Powering An Inverter With A Generator – Why didn’t it work and what’s the solution? Inverter Installation – What do you need and can you fit one yourself? Ironing Board On Board – How do boaters manage a crease free life? Knots – Narrowboat Knots – Do you know your bowline from your buntline hitch, your cleat hitch from your clove hitch or your poacher’s knot from your square knot? No? It’s about time you did! Lightning – Is there a risk of your narrowboat being struck by lightning? Live aboard narrowboat – Liveaboard Conclusions – Mel Davies has been doing plenty of research into her hoped for lifestyle afloat. Here are the conclusions she’s reached and comments from a few existing liveaboard narrowboat owners. Lock Techniques – How do you handle a narrowboat in a lock on your own? Mail services – Receiving post on your boat – How does the postman find you when you’re cruising? How do you apply for a driving license, a TV license or a bank statement when you have no official address? Maps – GPS Devices and Canal Mapping – Are there any decent ones available for your narrowboat and do you need them anyway? Mobile Broadband Internet access – How do you connect to the internet when you live on a boat? Mooring in winter – Winter on the cut – Are you able to cruise all year on your boat or should you find a mooring for the winter? Mooring fees – It’s Official: There’s No Need To Pay Mooring Fees – Or so this Daily Mail article claims. You may disagree. I do. Moorings – Different Types of Mooring – What’s the difference between residential and leisure moorings? How long can you stay on your boat with each type? Mooring Pins and Piling Hooks – What are they and when do you use them? Music – Getting Rid Of Space Wasting CD’s & DVD’s – The solution is to digitise your collection. Here’s how to do it. Narrowboat Choice – How to find a narrowboat to live on – Here’s an article about choosing a liveaboard narrowboat, and a question about finding a narrowboat with a steering wheel. Narrowboat hire (long term) – If you aren’t ready to buy a narrowboat yet, what are your chances of hiring a narrowboat for more than a few weeks? Overcrowded Waterways – More and more people are choosing a life afloat. Are the waterways becoming congested? Overplating/Replating – What’s the difference between the two and what’s involved in having the work done? Ownership – Determining Proof Of Ownership – How do you prove that the person offering a narrowboat for sale is the real owner? Planning – Boat Planning & Design – Is there any free software available to hel you plan your dream boat? Postal services – Receiving post on your boat – How does the postman find you when you’re cruising? How do you apply for a driving license, a TV license or a bank statement when you have no official address? Pram Covers – “Pram cover” is the term for a cover over the rear deck, usually on a cruiser stern narrowboat. Here are the pros and cons. Replating – Overplating/Replating – What’s the difference between the two and what’s involved in having the work done? River cruising – The difference between cruising on canalas and rivers – This is a very popular thread for very good reason. It’s packed with advice if you’re new to river cruising. Rivers – Handling Floodwaters – How safe is a river mooring during and after heavy rain? Can you stay on a river when the level rises? What can you do to minimise danger? Ropes – Which Ropes To Use? – There are so many different types available. Are the more expensive ones worth using or is it just a case of money for old rope? Single handed Lock Techniques – How do you handle a narrowboat in a lock on your own? Single handed boating – How do you handle a narrowboat on your own? Single Handed Boating for Ladies – Can a lady on her own pass safely through locks? Steam Power – Are there any steam powered narrowboats on the network? Steel – Narrowboat steel thickness – How thick is your boat’s steel? How long does it last? Stoppages – The Trust carry out essential scheduled repairs during the quieter, cooler months. Here’s their planned stoppages for the coming winter. Stoves – Choosing a stove for your boat – Are domestic solid fuel stoves as good as the ones designed specifically for boats? Which is the best one to buy? Stove Top Fans – Are they worth the money? Stoves – Retro fitting a solid fuel stove – Where’s the best place to put your stove and what’s involved in fitting it? Survey Costs – How much should you pay to have your boat removed from the water for a survey? Television reception – Which aerial is best? Tips – ONE tip to offer a potential narrowboat owner – If you are already a narrowboat owner, you can share your experience. If you haven’t bought one yet, you need to read this thread. Toilets – Converting from a cassette toilet to a pump out – A pump out toilet is far more convenient to use than a toilet with a portable cassette but how easy are they to retro fit in a narrowboat? Toilets – Pump Out: Flushing Out a Toilet Waste Tank – Emptying your pumpout toilet holding tank isn’t just a case of sucking out your unmentionables. You also need to flush water through the tank to remove the built up solids. Here’s how to do it. Tunnels – How do you navigate them? Who has priority? VAT on narrowboat sales – Does the price of your narrowboat contain a VAT element? Can the VAT be reclaimed? Vertigo – How to deal with walking over lock gates if you’re frightened of heights. Visitor Moorings With Shore Power – Sometimes you need to hook up to the mains when you moor for the night. Where can you find these moorings? Washing Machines – 12v Narrowboat Washing Machines – Is there any such animal? Weight on a narrowboat – How many people can you carry on a narrowboat, and how much luggage can they bring with them? Windows Choice – Windows Or Portholes – Round or square, which is best? Is it just a matter of personal preference? Windows – Condensation – Why do narrowboat owners tolerate condensation? Why don’t they have modern uPVC windows fitted? Winter moorings – Winter on the cut – Are you able to cruise all year on your boat or should you find a mooring for the winter? Is anything wrong or missing from this list? Please let me know. I had an email from Brian Colling earlier in the week asking whether I ever managed to publish the concluding part of his very detailed blog about how his aluminium Sea Otter narrowboat was built. I remember publishing the final part but I couldn’t remember where I had linked to it in one of the newsletters. After ten minutes of fruitless searching I realised that the reason I couldn’t remember where I had linked to it was that I hadn’t actually mentioned the final part anywhere. Please accept my apologies Brian for the oversight. Here is the final part of the excellent series and, if you missed them when they were published, I have listed the first eight parts below. Following last week’s newsletter about earning money while continuously cruising, I received an email from a lady by the name of Sarah-May who is also known to her customers as Baddie the Pirate. Sarah-May sells LED lights and fitting from her boat as she cruises the network. Here’s how she manages to combine business with leisurely exploration. “A few years back it was difficult to find LEDs that were bright enough to be any use. 5 years ago when I discovered SMDs (surface mounted diodes to those in the know) I decided to go for it and started my boat-based LED business. I have a website, but I do a lot of sales face to face along the towpath and whilst waiting to go through locks in the summer queues. I have a little case of goodies which I visit peoples boats with, and help them pick the right LEDs for their needs. I’ve picked up a lot of knowledge along the way so am able to give advice on converting to LED lighting. The logisitics vary depending on whether I’m moored up or on the move. I have to have a vehicle so I can get to the post office to post orders out. When I move the boat I then walk or cycle back for the car. Progress along the network tends to be slow but that suits me. 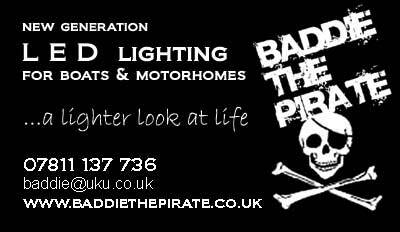 I have many customers who pass me, then come and find me a day or two later having had a think about LED lighting in the meantime. My rate of travel means I am normally still in range. I have a superb network of friends and relations around the country who receive post for me and deliver stock. So far I’ve managed to explore many of the northern and central canals. I have plans to explore further south in the foreseable future, taking my business along with me, and making more sales and more friends along the way. Each time I write a newsletter, I tick another subject off the list of things which those new to boating have told me that they want to read about. The hardest part of the process isn’t the writing itself, it’s constantly thinking of new content for each issue. The trouble is, I don’t know what you want to read. I think I keep the newsletters reasonably interesting but I don’t know for sure. That’s where I need your help. Can you let me know what you would like to read in the future? Are there any areas of narrowboat life you don’t think I’ve covered enough or areas which I’ve missed completely? Please let me know what you want to read about. Thanks for your help. I created the site just over three years ago to provide a source of information for anyone interested in narrowboats and the possibility of living on one full time. The site has grown to encompass a comprehensive listing of inland marinas in England and Wales, dozens of articles, a forum and regular newsletters. I’ve already created (below) indexes of the site articles and the more popular forum posts. I thought it was about time I created an easy to use index of the newsletter content. Here’s the index so far. How do you continue to earn money to support your boating lifestyle as you cruise the network? Sharing your narrowboat space – The practicalities of sharing living accommodation the same size as a large shed. Paying for a narrowboat – What practical steps can you take to ensure you’ve established legal ownership and how do you deal with the transfer of monies between buyer and seller? Narrowboat Knots – At my first lock on my first cruise I watched my boat drift into the centre of the canal along with my twelve year old son. If you want to avoid the same embarrassment and potential damage to both your boat and your self esteem, you need to know how to tie your boat securely in a number of different situations. Toilets is a subject often discussed by narrowboat owners but they usually talk about either pump out or cassette toilets. There is a third type though and it’s one which is both environmentally friendly and cheap to run. Here’s all you need to know about composting toilets. Here’s an account of my very first winter on board and that of one of the site’s subscribers, Nigel Buttery. They’re very different experiences. My first winter was the coldest on record. Nigel’s is one of the mildest winters we’ve had for a long time. I’ve also included to links to my Philippines blog. I spent the whole of February living in a rural farming community on the island of Negros. Have you ever wondered how a narowboat is built. Here are the first two parts of a very detailed account of the building of a Sea Otter aluminium narrowboat. You’ll be particularly interested in Sea Otters if you don’t fancy the constant battle with rust that you have with traditional steel narrowboats. Condensation is something all boat owners have to deal with. Here’s an explanation of why it occurs and what to do about it. I also tested a remote boat monitoring application in this issue. Cold floors, cold air above the floors and cold hull sides. It’s a combination which can cause your bottom half quite a bit of discomfort. Here’s what I do to deal with the problem. Weil’s disease – It’s an often talked about and often feared aspect of living, working or playing close to inland waterways but just how dangerous is it and what can you do to keep yourself safe? Planning for the year ahead – Written plans and goals have always been important to me. They help me see into the future. Here’s what we’ve planned for our lovely floating home in 2014. The practicality of hosting Christmas afloat – How do you achieve a floating festive event (and do you really want to)? Liveaboard case study, The Pearl – Tony and Jane Robinson believe in forward planning. They stated their narrowboat fund thirty years before buying their own boat. Now the two retired education workers moor in a marina for the winter then explore the waterways during the warmer months. Narrowboat Storage Space – How much space is there to store your worldly goods on board a narrowboat? Here’s a video walk-through of my own boat James. Roses and Castles Canal Art – What is it and why do boaters spend so much money decorating their boats with it? Fitting secondary double glazing – Fitting the panels is a simple operation for those with the most basic DIY skills, something which I sadly haven’t developed. As you might expect then, the fitting didn’t go as well as it should. Secondary double glazing for your boat – The pros and cons of double glazing on a boat and why secondary double glazing is a much better bet and a fraction of the cost. Can you either live or holiday on a narrowboat if you have a disability? – Here’s what you need to know. Winter fuel allowance – Do you qualify for one if you live on a boat? Case Study – NB Progress. Kim Wainwright recorded her journey on the forum from nervous anticipation to current liveaboard boat owner. Here’s her story. Narrowboat central heating – I don’t have any. All that is about to change. Here’s the system I’m going to install and why I’ve chosen it. Popular narrowboat terminology – Hundreds or words or phrases used to describe parts of boats and the waterways they cruise through. The wind chill factor – How strong the wind is blowing and which direction it’s coming from can determine how difficult it is to heat your boat. Here’s what you need to know. Case study – Another couple from down under living the dream on the inland waterways. 20th October 2013Condensation. It’s a common problem on boats. Here are a few suggestions how to keep your boat’s interior dry. On demand water heater problems – Discover a common fault with these water heaters and what you can do to resolve the problem. Know your firewood – Not all timber burns well. Find out which is best and which to avoid. Managing your boat’s water supply. You can use your water supply as and when you need it when you live in a house with all mod cons. You can pretty much do the same when you’re on a marina mooring with a water supply just a hose length away. It’s a different kettle of fish when you’re on an online mooring. Liveaboard case study – A prime example of mooring without a water supply on tap. Creating lasting memories of your cruises – Slightly off topic, but please bear with me. You’ll have some wonderful adventures as you travel throughout the network. They’ll be adventures worth remembering but will you remember them? I have a very poor memory but instant and total recall of all my cruises is just a click away. A disaster – I inadvertently deleted this week’s newsletter and there wasn’t a backup on the server. What a shame. It was all about the damage you can do to your boat if you don’t watch what you’re doing in a lock. You would have loved it! Liveaboard Case Study – American Richard Varnes has taken a year out from work to cruise the canal network and write about his adventure. Here’s his case study and a few stories from his journey so far. CART Guide Approval – The waterways’ governing body is now promoting the information packages available from this site. Yippee! Downsizing from a 3 bed semi to a narrowboat – What do you do with a lifetime’s accumulated possessions? The perfect narrowboat washing machine? – It’s low cost and doesn’t need plumbing in, but does it actually clean clothes? The cost of a continuous cruising lifestyle – How much does living the life of a water gypsy really cost? The cost of living on a narrowboat – An article in the Daily Mail… and why most boaters disagree with what they said. Hire boat expectations – Fully understanding what facilities will be available to you is essential if you’re going to enjoy a narrowboat holiday. Here’s what not to do. Fenland river cruising – Another boater’s maiden voyage to whet your appetite. Anticipating winter weather – You may well be enjoying unusually warm winter weather but the winter will be with us all too soon. Now is the time that you need to plan for the cold weather ahead. Keeping your stove glass clean – Maybe you think it’s an odd subject for the summer but you can’t trust the English weather. Late June and the stove was still on now and again. At least now I have a crystal clear view of the fire I shouldn’t need to light. Traffic chaos caused by Braunston’s historic boat rally – On a day with high winds and a canal full of working boats returning home after the rally, I had the pleasure of taking some very nervous hirers out on the cut. 23rd June 2013 – The cost of a two week cruise. If you live on your own boat, what’s the real cost of taking it away for a two week break? Case Study – Mary Anne swapped dry land home rental for floating home ownership. Now she loves life afloat and works from home. Life as a continuous cruiser – The Holy Grail of narrowboat ownership. The ability to travel where and when you like. Peter Early tells all. Considerate boating – An article prompted after a near head on collision with another boat trying to avoid a fallen oak. I was on holiday for the first two weeks of June. Sally and I cruised from Calcutt to Braunston, north along the north Oxford where we joined the Coventry canal briefly before taking a very sharp right turn onto the Ashby canal. Here’s a daily report of the first week of our holiday. Laptop hacking – An update on the problems I encountered after buying a brand new laptop which I suspect was tampered with before I bought it. My comments about an encounter on the Oxford/GU section between Napton and Braunston sparked a debate about the pros and cons of wide beams on the cut. Keeping dry – You don’t really need to limit your cruising to sunny summer days. There’s something very special about standing on the back deck in the pouring ran protected by a set of bomb proof waterproofs. Do you really need a car? Living on a narrowboat is all about enjoying a simple and stress free life. Sally and I had a car each. Mine cost £2,000 to run in the previous 12 months so I decided to get rid of mine to see if I could manage without one. Narrowboat blogs – My own first cruise, Our Nige takes his new home on its maiden voyage and a chance for you to have your very own blog section on this site. The Trust target illegal moorers but just what does the Trust consider to an illegal mooring? RCR engine servicing – River Canal Rescue (RCR) are well known as the waterways equivalent of the AA but did you know that they will also come to your mooring to service your boat? The perils of exceeding your monthly broadband data allowance. Learn from my mistakes. Case study – You need to committed to sell your home to fund the purchase of your narrowboat. That’s what Mick and Marlene have done. Case study – Sarah lives on wide beam Antioch on the Leeds Liverpool canal. She can do man things with her hands. Here’s her story. Be inspired – There are always reasons why you don’t make the move from bricks and mortar to steel and water. Here’s an anecdote which demonstrates once and for all that there really aren’t any worthwhile excuses. Here’s an example of what happens when you really don’t understand how your narrowboat works. Essential boating equipment – Here’s a low cost item which has paid for itself over and over again. Whilton marina boat sales – Sometimes things aren’t what they appear to be. This alleged fact about the boat sales at Whilton has come to me from several different sources. Half a dozen boaters now have access to their own blog section on the site. You can too. Here’s how. Essential stove maintenance – Here’s what you need to do to make sure that your stove always performs well. Internet connectivity – I use the internet four or more hours every day. This is the setup I have on my boat to make sure that I’m always connected. The real cost of going cheap. An in depth look at the cost of my 36 year old boat, and how much I spent (and still need to spend) before it will be a comfortable full time cruising boat. Case Studies – I put together 21 of the best case studies and analysed and summarised the data in this low cost guide. If you want ton save yourself hundreds of hours of research and costly mistakes, you need to read this guide. I asked newsletter subscribers to send me detailed breakdowns of their bricks and mortar expenses so I could compare them with the cost of running a narrowboat. Quite a few subscribers obliged. I added the breakdowns to my narrowboat costs guide and the budgeting application. I published my guide Living on a Narrowboat: The REAL Cost of a Life Afloat. When this newsletter was published it was only available as a Kindle edition. Now it’s available in both Kindle and PDF format and is bundled with Narrowbudget, the site’s bespoke narrowboat budgeting application. How to clean your stove glass – One of the real pleasures of a living fire is watching the flames on a cold winter’s eve. Here’s what you need to do to ensure you can actually see the fire. As a result of the article about the downside of living on a narrowboat published in the 18th March newsletter, I asked liveaboard narrowboat owners to complete a survey to give a balanced view of the issues raised by Pauline. Here are the survey results and a much more positive article by liveaboard narrowboat owner and frequent forum contributer Peter Early. Case study: The Woodsman – Pauline Roberts again giving an insight into the life that you may think she doesn’t like. Two more case studies. One of them waxed lyrical about life on the waterways and enjoyed every minute of her life afloat. Now (April 2013) she’s selling up to follow another dream in Spain. Here are another working couple. Lina and Warren cruise the cut with their two cats.Narrowboat Olive Rose case study. There are dozens of helpful and interesting articles on the site, but have you found them all? I thought you might appreciate a list of the more popular articles that you can glance through and click on the ones that take your fancy. Here it is. There’s a wealth of information on the site in general, but if you’re struggling to find the answer to a particular issue, the forum is the place to find it. I’ve listed some of the more popular posts below but if you can’t find what you’re looking for, ask your question on the forum. If you don’t know how to create a post, or if you can’t log in, please let me know. I’ll be more than happy to get you up and running. Aluminium Boats – They don’t rust so why don’t you see more of them on the inland waterways? GPS Devices and Canal Mapping – Are there any decent ones available for your narrowboat and do you need them anyway? A Big Inverter Or A Suitcase Generator – What are the pros and cons of either option? Who Owns Your Boat? – How do you find out if there’s still finance attached to your boat when you buy it. Getting Rid Of Space Wasting CD’s & DVD’s – The solution is to digitise your collection. Here’s how to do it. The Cost Of Continuous Cruising – How much does the nomadic lifestyle really cost? 12v Narrowboat Washing Machines – Is there any such animal? Post & Postal Addresses For Continuous Cruisers – You need an address in order to receive post and open bank accounts, register for doctors and hospitals etc. How do continuous cruisers with no fixed abode manage it. It’s Official: There’s No Need To Pay Mooring Fees – Or so this Daily Mail article claims. You may disagree. I do. VAT On New Narrowboats – Can you knock 20% off the cost of your new narrowboat? Narrowboat Burglary – Two boats burgled at the same location. Where is it and what can you do to minimise the risk of theft from your own boat wherever you are? Insuring Your Car When You Live On A Boat – A boat owner had his car insurance cancelled when he told them he lives on a narrowboat. How does he approach other insurance companies? The Logistics Of Buying A Boat – A fascinating account from a potential narrowboat owner as he tried to get a boat out of the water so that it can be suryeyed. Winter Stoppages 2013/2014 – The Trust carry out essential scheduled repairs during the quieter, cooler months. Here’s their planned stoppages for the coming winter. A New Narrowboat Dog – Alan recently moved on board his own floating home. He loved his new boat but something was missing. Now he has a new best friend and he’s in love, although his new best friend has proven a bit of a challenge. The difference between cruising on canalas and rivers – This is a very popular thread for very good reason. It’s packed with advice if you’re new to river cruising. Checklists – What do you need to check before you set off on a cruise? There’s some very detailed information including a very useful post by fellow Calcutt moorer Graham who has issues with his mobility after an RTA many years ago. Television Aerials – If you can’t live without your Corrie, you’ll need a decent aerial for your boat. My New Life – I urge you to read this forum thread. If you dream of living on your own narrowboat one day, reading this post, written by a new liveaboard boater, may well prove the catalyst you need. It’s essential reading for any aspiring narrowboat owner. Narrowboat Ownership – How do you prove that the person offering a narrowboat for sale is the real owner? Internet Data Theft – Did you know that fellow boaters can steal your internet data allowance? Boat Planning & Design – Is there any free software available to hel you plan your dream boat? A Narrowboat Checklist – What checks do you need to carry out before you set out on a cruise? Windows Or Portholes – Round or square, which is best? Is it just a matter of personal preference? Day To Day Questions About Narrowboat Life – How can “newbies” find out the answers to questions about day to day life on a narrowboat? The answer is simple. Find out by reading this post. Flushing Out a Toilet Waste Tank – Emptying your pumpout toilet holding tank isn’t just a case of sucking out your unmentionables. You also need to flush water through the tank to remove the built up solids. Here’s how to do it. Narrowboat Knots – Do you know your bowline from your buntline hitch, your cleat hitch from your clove hitch or your poacher’s knot from your square knot? No? It’s about time you did! Narrowboat Furniture – Not everyone wants fitted furniture on their boat. Here are a few ideas if you want to add your own. Narrowboat Finance – A Canadian hoping to move to the UK, buy a boat and cruise the network. Problems Powering An Inverter With A Generator – Why didn’t it work and what’s the solution? Different Types of Mooring – What’s the difference between residential and leisure moorings? How long can you stay on your boat with each type? Which Ropes To Use? – There are so many different types available. Are the more expensive ones worth using or is it just a case of money for old rope? Windows – Why do narrowboat owners tolerate condensation? Why don’t they have modern uPVC windows fitted? Best Ex Hire Boats – Are you considering buying an ex hire boat to live on? Should you? Here’s some important information for you. Liveaboard Conclusions – Mel Davies has been doing plenty of research into her hoped for lifestyle afloat. Here are the conclusions she’s reached and comments from a few existing liveaboard narrowboat owners. Handling Floodwaters – How safe is a river mooring during and after heavy rain? Can you stay on a river when the level rises? What can you do to minimise danger? Narrowboat steel thickness – How thick is your boat’s steel? How long does it last? Retro fitting a solid fuel stove – Where’s the best place to put your stove and what’s involved in fitting it? Converting from a cassette toilet to a pump out – A pump out toilet is far more convenient to use than a toilet with a portable cassette but how easy are they to retro fit in a narrowboat? Winter on the cut – Are you able to cruise all year on your boat or should you find a mooring for the winter? Bike types and preferences – If you don’t have a car parked near your boat, you’ll probably want a bike, but which type of bike is best? Towing a butty – I’ve upset someone. I didn’t mean to. Wainbody wanted to know the best way of towing an unpowered second narrowboat (butty). I came across as patronising when I replied. It was unintentional but to make amends I thought I would ask anyone with boat handling experience to reply to his thread with some constructive advice. If you can help him, please reply to the post. The best flooring for a narrowboat pets – What’s the best way to protect your floor from a dirty doggy? The best time of the year to buy a boat – Is there a deal to be done by buying a boat in the winter? ONE tip to offer a potential narrowboat owner – If you are already a narrowboat owner, you can share your experience. If you haven’t bought one yet, you need to read this thread. Powering your computer on a narrowboat – Can you power your computer/laptop from the boat’s 12v supply or do you need mains power? Choosing a stove for your boat – Are domestic solid fuel stoves as good as the ones designed specifically for boats? Which is the best one to buy? Diesel heating for boats – How important is a solid fuel stove on a liveaboard narrowboat? Is a diesel heating system OK as a primary heat source? Receiving post on your boat – How does the postman find you when you’re cruising? How do you apply for a driving license, a TV license or a bank statement when you have no official address? Bikes on board – Many boat owners do not have cars so they rely on bikes to get them to the shops (or the pub). Some use bikes to collect their cars after a day’s cruising. There’s a huge selection of bikes to choose from. Which are the best for your boat? To tell you the truth, I don’t know the answer. Can you point forum member Ainslo in the right direction? Living off property rental income – Do you have a property that you indend to let while you cruise the waterways? Read this before you work out your budget. How to find a narrowboat to live on – Here’s an article about choosing a liveaboard narrowboat, and a question about finding a narrowboat with a steering wheel. Long term narrowboat hire – If you aren’t ready to buy a narrowboat yet, what are your chances of hiring a narrowboat for more than a few weeks? Too tall for a narrowboat? – Is a narrowboat suitable for you if you are above average height? Dealing with condensation – Do all narrowboats suffer from damp? What can you do about it? Living on a Narrowboat: The REAL Cost of a Life Afloat – Narrowboat costs explained in detail. My own maintenance and living cost on narrowboat James for a full year. Use this information to work out your own costs. CRT (Canal & River Trust) maintain the waterways. Here’s their site. Find out what parts of the canal are closed and for how long. Essential cruising information for you. Do you want to see where these marinas are on a map? Here it is. Here’s a map of all the canals on the system to help you plan your route. Newsletter Archive – Browse through a wealth of useful content in the newsletters over the last year. Find out more about narrowboat central heating costs here. If you enjoy reading these posts, if you find the masses of information on this site and my new motorhome site, rvblog.co.uk both useful and entertaining, please help keep it available for those who both want and need it. There are eight years of painstakingly written and researched information on hundreds of posts and pages on the two sites. They may be lost forever if I can't find a way to maintain them. Click on the button below to find out more. After six and a half years living on a narrowboat on England's inland waterways, Paul and his wife Cynthia wandered Europe by motorhome during the winter, and on the Dutch and French waterways in the warmer months on their 35' Dutch motor cruiser. However, the pull of England's muddy ditches proved too much for them. Now they're back where they belong, constantly stuck in mud in a beautiful traditional narrowboat.